The Turkish Lira (TRY) has remained weak against the US Dollar so far in 2016, validating our long standing view that it is currently one of the most vulnerable emerging market currencies. 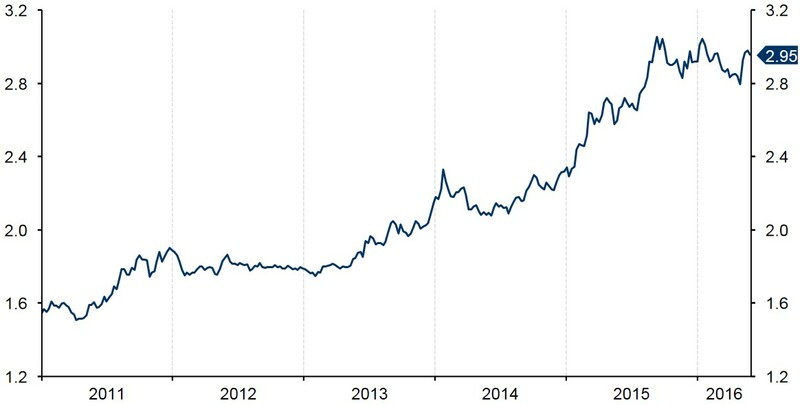 The Lira has depreciated sharply over the last year, declining by close to 30% since the beginning of 2015 (Figure 1). Turkey presents an uncertain political backdrop that has dampened investor sentiment and contributed towards much of the Lira’s recent depreciation. The currency plunged at the beginning of May when Prime Minister Ahmet Davutoglu announced his resignation after just 20 months at the helm following failed talks with Turkey’s President, Recep Erdogan. This has reignited concerns among investors that President Erdogan may succeed in expanding his powers, thus transforming his once largely ceremonial position. The appointment of close ally Binali Yildirim as the new leader of the ruling AK Party in May has further soured sentiment towards the Lira. Despite the worsening political situation, the Turkish economy has staged a remarkably strong recovery of late. Economic growth in the final quarter of last year surprised on the upside with the economy expanding 5.7% on the previous year, its strongest quarterly growth rate in four years and one of the fastest in the G20 (Figure 2). Furthermore, headline inflation has slowed sharply since the beginning of the year, falling by around three percent to 6.6% in April, its lowest level since 2013. 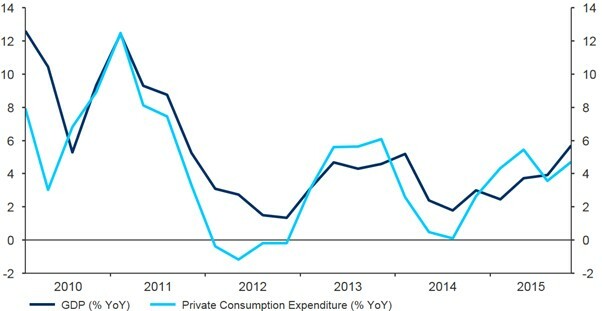 This slowdown is almost entirely due to lower energy prices with core inflation remaining stuck well above 9%. The Central Bank of Turkey (CBRT) cut its main interest rate at its latest monetary policy meeting in May to 9.5%, although it kept the one week repo and O/N borrowing rates unchanged at 7.5% and 7.25% respectively. The CBRT has faced increasing pressure from the government to cut interest rates and adopt a more growth focused mandate. 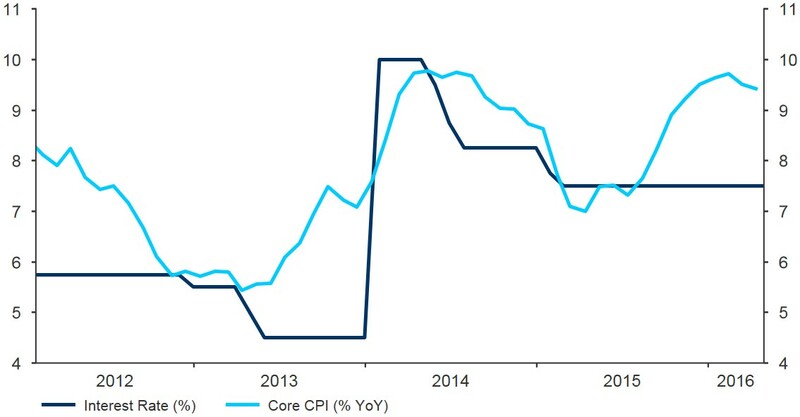 These cuts mean that the main interest rates in Turkey are now below the level of core inflation, removing one of the key supports for the Lira (Figure 3). On a more positive note, Turkey’s characteristic as a net commodity importer has improved the balance of trade, with the deficit falling to its lowest level in over six years in February. The current account deficit also narrowed last year, mainly due to declining oil prices, to a more sustainable level of 2-3% of GDP. What does the future hold for TRY? Despite the general improvement in economic conditions in Turkey, the still uncertain political situation and large current account financing needs should ensure a long-term depreciation of the Lira against the US Dollar amid gradually increasing interest rates in the US. However, we believe the large scale easing measures launched by the European Central Bank in the Eurozone will lead a mild appreciation of the Lira against the Euro. Get in touch to discuss your Turkish Lira exposure.